The title of this post is quite literal and I've spent the past few days laminating the back splats. As of tonight, I have four splats laminated and a fifth splat is clamped to the form and drying. I need a total of six splats to make up the back support of the chair. I had a bit of an issue with the first splat that I glued up and the (3) 1/8" strips did not stay aligned when I clamped them to the form. This might not seem like a big deal, but the splat ended up being too narrow after I milled off the uneven edges. Luckily, I have plenty of extra material to cut (3) more 1/8" strips to make a 7th splat and I'll just discard the first "mistake splat." To avoid repeating my mistake, I now use a small clamp at each end of the splat to hold the strips in alignment while I'm clamping them to the form. I should have the splat laminating done by Saturday...hopefully. Then it will be on to laminating the runners. 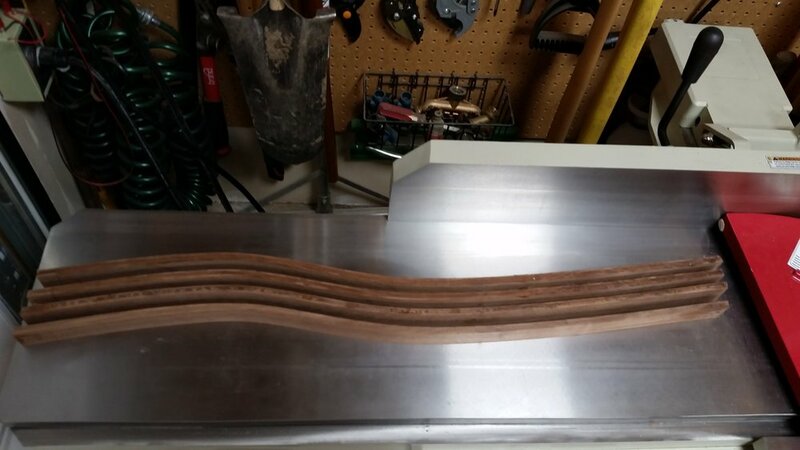 I learned my lesson and started using small clamps on each end to hold the edges of the strips in alignment with each other. Side view of the first four rough splats. Top view of first four splats.